This new romance film of lovers who are separated worlds apart is an ambitious story that unfortunately never hits its mark, but there’s still a meandering joy to be appreciated here. 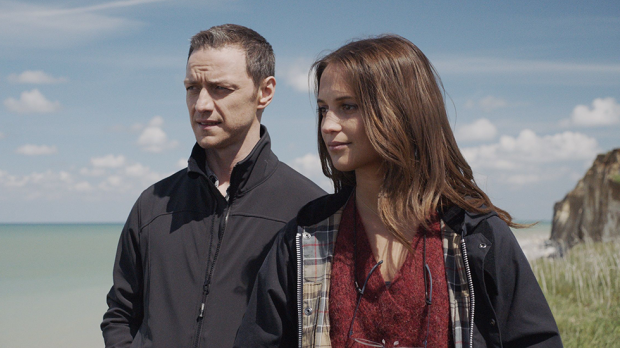 Submergence indulges in the disparity of the lives between these two lovers: Danielle (Alicia Vikander) is a theoretical biologist sent out into the Greenland Sea to investigate new deep-water specimens, whilst James (James McAvoy) is having far less fun in Somalia where he has been held captive by jihadis. Before this time of their separation, Danielle and James first cross paths in a French seaside bed and breakfast, where they are shown to have a weekend fling before setting off for their new adventures (or, in James’ case, misadventure). And a good portion of the rest of the film is Danielle moping on her voyage that he hasn’t returned her calls, unaware that he has been stripped of his phone (and many other human rights) by the African jihadists that have imprisoned him. This is the sort of romance film where you may feel more in love with the story or the filmmaking than the romance itself. There’s no real, compelling reason for these lovebirds to fall for each other, other than the fact they are both ridiculously gorgeous. But there is still some fascinating moments scattered throughout their initial encounters, such as when they both go into detail about their vocations or when they debate which is more important, discovering new life or trying to sustain current life. Submergence may elicit eye-rolling from folks that are disappointed and underwhelmed by this rushed romance, but unusually for a romance film, it’s the love story that is the least interesting aspect. The individual stories of Danielle and James, although not solid in their relation to each other, are intriguing for their own reasons, whether it’s Danielle’s mystical search for meaning in undiscovered depths, or James’ resilience in the face of terror. Submergence is the sort of ponderous film that exists in an existential quandary: it feels meaningful as it moves along, but ultimately doesn’t lead to much. It’s an airy, transient piece of work, and feels accidentally so, but in regards to its cinematic craftsmanship, there’s a unique auteur approach to these dual stories where there’s at least enough fascination and interest to be unearthed.